Probiotics are simply put; good bacteria. These are especially helpful to the digestive system. Probiotics by YouthBerry let you enjoy your life to the fullest. They energise you, and improve your immunity. These also aid you in relieving stress and anxiety. Like the billions of other beneficial microorganisms in our digestive tract, the probiotics help us to digest food, produces vitamins, facilitates digestion and excretion; thereby improving our overall health and vitality. YouthBerry’s Happy Bowel has a blend of good bacteria that you definitely want living inside your small intestine. 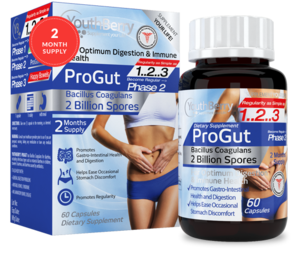 YouthBerry’s ProGut has Bacillus Coagulans for diarrhea, including infectious types such as rotaviral diarrhea in children; traveler’ s diarrhea; and diarrhea caused by antibiotics. The ProGut supplements also promote gastro-intestinal health and digestion, and ease with the occasional stomach discomfort. Probiotics are live bacteria that are good for your health, especially your digestive system. We usually think of bacteria as something that causes diseases. But, our body is full of bacteria, both good and bad. Probiotics are often called “good”; or “helpful” bacteria because they help keep our gut healthy. YouthBerry’s ProZyme has pharmaceutical grade Bacillus Clausii spore strains that balances our immunity and promotes healthy intestinal function along with restoring and protecting a healthy digestion.